A Year of Being Here: Anne Porter: "Getting Up Early"
"Getting Up Early" by Anne Porter, from An All Together Different Language. © Zoland Books, 1994. Photography credit: "Full moon rises over rooftops in New York," by Stan Honda/AFP/Getty Images. 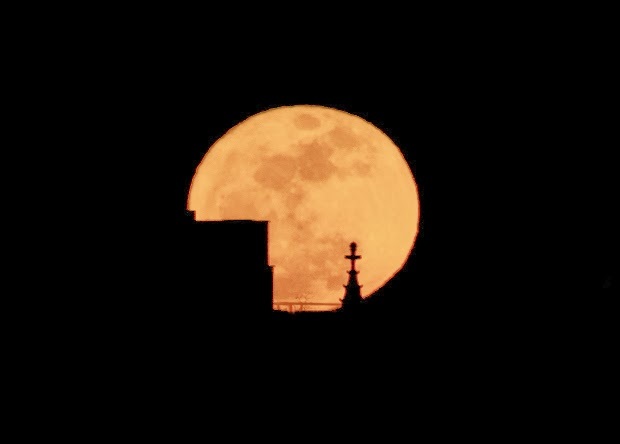 "The full moon rises over rooftops March 19, 2011 in this view from the east side of Manhattan in New York. The full moon coincided with its closest approach to the Earth, 221,565 miles (356,575 km), making the so-called `super moon' look slightly larger than average" (originally color).